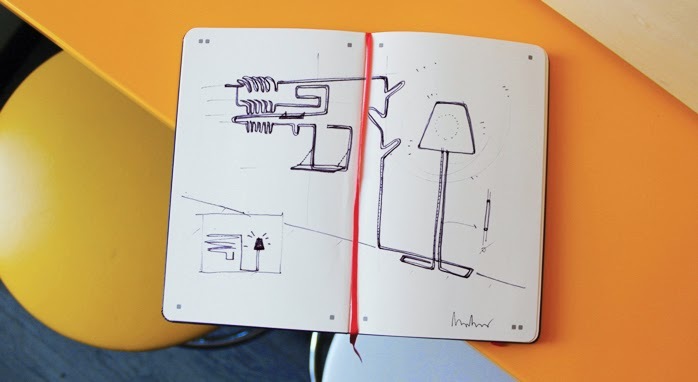 Moleskine joins forces with Ventura Lambrate to set up a Documentation Centre for design innovation at Milan Design Week. Roaming the post-industrial warehouses and bustling streets of Ventura-Lambrate - with the Moleskine smart notebook, Creative Cloud connected in hand - a team of design reporters sketch the ideas they find in the objects, installations, crowds and showrooms of the innovative design district during Milan Design Week. Little page markers in the corners of each page are recognized by a companion app, which optimizes and digitizes the hand-drawn images with a simple capture. The design reporters then upload their sketches to the Creative Cloud as fully workable vector files, which are finally elaborated by a designer live from the Documentation Centre at Via Ventura 14. Projected onto a screen is this part of the creative process, with original sketches and printed works exhibited alongside, completing the circle of creativity.